No show all nights booked will be charged. Groups must cancel 14 days in advance. 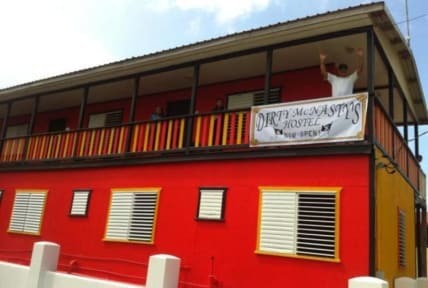 Dirty McNasty's is the Largest hostel in Belize, that is as diverse as the island of Caye Caulker. We have something for everyone whether you are a backpacker, world traveler, or vacationer. Private rooms include one double bed, and private restroom with hot and cold water. Air Con Private rooms include one double bed, and private restroom with hot and cold water. Dorm style rooms that sleep anywhere six to sixteeen with three to eight bunkbeds. Each bed has it's own lockable storage space for personal belongings. Each dorm has its own private restroom with hot and cold water. Some dorm rooms have Air Con. Rum Punch at 7:00 PM every night. Enjoy our 2400sq.ft. 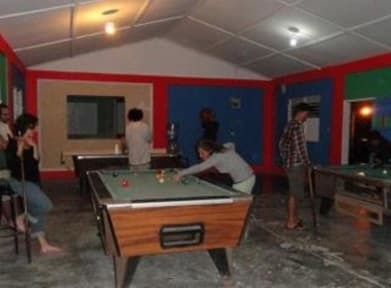 bar/restaurant area with pool tables, darts, and games or our large courtyard for gatherings with picnic tables. We heard and read a lot of mixed reviews about this place but found it to be just great. There are new bathrooms in the back of the hostel that are really nice and the beds were pretty decent! The staff was awesome and full of recommendations and smiles. Great place to meet friends! This has just been reopened after renovation so was pretty quiet but the people that were there and the staff made it a great few days away. Really good location. Free rum punch every night and free breakfast in the morning, what more could you want? Its always a party at Dirty McNastys! The free Rum Punch EVERY night gets the party started. Shane (AKA front desk supervisor, bartender, Cook) is the best asset to Dirty McNastys. He is very helpful and will help you with whatever you need. If you want to have a great time on Caye Caulker and don't really care too much about where you rest your head then this is the place for you. Great for socialization and fantastic value! Not for everyone but was just what I was looking for. We stayed here while it was being renovated. Jeff was very helpful and our stay was nice. I look forward to revisiting to see how it looks! Not as McNasty as some people say. Dorms are fine, showers are a bit grim like any hostel and once when we were there the water didn't work so toilets didn't flush. But definitely worth it for the atmosphere, free breakfast and punch are great too. We got there and they didn't have the room we booked. Staff was pretty cool until we got the bill and the charged us double bc "they charge in USD" even after showing him what was owed from the hostelworld email they refused to honor it. We emailed them directly and they never responded. Take advantage of the drinks during Happy Hour. There was a hilarious group of Irish dudes there, which were the only reason we ended up staying the entire time. A fun hostel, but not the cleanest place. We stayed in the 16 bed room with aircon. The aircon worked the first night but it was leaking water. The second night it was completly off. We had two showers and two toilets for the room. One toilet didn't flush and the one that worked you couldn't lock. The showers were ok. The beds were very unconfortable. The breakfast you could choose between pancakes, omlett and eggs, which was good. The staff did make the impression to be high all the time and even offered us drugs, NO GO! Upon arrival I was told even though I had a reservation they had no room. When I asked for my deposit was told no. After some conversation with another staff member we wer given a bed unmade & unchanged from the previous occupant. Had to DEMAND new linen which I changed myself. We left to town for a little bit and came back to our things moved and people in our beds saying they were told they could hav those bunks. Staff also gave anyone and everyone room codes. RIDICULOUS. NEVER STAY HERE!! !